Michigan Lawyers Weekly included us on their list of the top 10 attorneys. Detroit News called our founding attorney, Brian McKeen, the state's most-winning medical malpractice lawyer. Mr. McKeen has also been listed by Super Lawyers magazine, and is a member of the Inner Circle of Advocates, an invitation-only group of trial lawyers, limited to 100 members throughout the United States, who have won at least three $1 million jury verdicts. These accolades reflect how resolute we are to do what is right for our military and retired military clients. If you have suffered because of medical negligence or injury at a VA Hospital or government clinic or building, contact us online or call 866-585-1076. 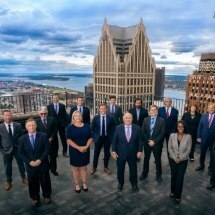 Our law firm has held the honor of achieving the biggest verdict in Michigan four times since 2001. Our lawyers understand that we can't simply bully our way into results. Investigation is important. Strategy is critical. Preparation and a complete understanding of the Federal Tort Claims Act is vital. Throw in more than 25 years of experience and you have a winning combination. Do you have a case? Find out more about the Federal Tort Claims Act and how to file notice of your claim. You have served your country. You have the right to consult an experienced attorney about your military-related medical malpractice or personal injury case. The law firm of McKeen & Associates can provide you with the representation you deserve.